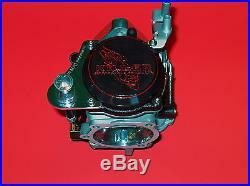 THIS CARB IS SET UP FOR SHOVELHEAD AND IRONHEAD HARLEY DAVIDSONS. 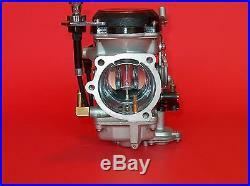 THIS CARB WILL BOLT ON TO YOUR STOCK OR S&S E MANIFOLDS. 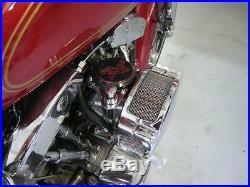 THIS CARB COMES COMPLETE AS PICTURED WITH OUR MOUNTING FLANGE AND CUSTOM CHOKE SET UP! OUR PARTS ARE MADE IN THE U. I HAVE A COUPLE OF QUESTIONS FOR YOU. IS YOUR BIKE HARD TO START WHEN IT'S COLD? DOES YOUR BIKE SOMETIMES POP AND BACKFIRE THROUGH THE CARB? AND DOES YOUR BIKE HESITATE WHEN YOU GIVE IT THE GAS TO MAKE A PASS OR JUST FEEL LIKE IT'S LACKING WHEN YOU OPEN UP THE THROTTLE? DID YOU PUT NEW PIPES OR A NEW HIGH PERFORMANCE AIR FILTER SYSTEM ON YOUR BIKE ONLY TO BE DISAPPOINTED IN HOW IT RUNS? IF YOU CAN ANSWER YES TO ANY OR ALL OF THESE QUESTIONS AND YOUR TIRED OF YOUR NICE HARLEY RUNNING LIKE CRAP! THEN YOU MIGHT BE INTERESTED IN MY KILLER PERFORMANCE TUNED CV CARBS. THE DEMAND HAS BEEN SO HIGH SINCE WE DEVELOPED THIS CARB THAT WE DECIDED TO PUT IT INTO A COMPLETE PACKAGE SO SHOVELHEAD AND IRONHEAD OWNERS CAN CAN RIDE THIR BIKES INSTEAD OF WORKING ON THEM. THE FACT IS THE HARLEY 40MM CV IS ONE OF THE BEST [HIGH PERFORMANCE] CARBS MADE, AND THAT'S WHY HARLEY HAS USED IT FOR THE LAST 20 YEARS. NOT TO MENTION ALL THE METRIC, GERMAN AND BRITISH BIKES USE THEM TOO. EPA REGULATIONS ON EMISSIONS AND NOISE FORCE THE FACTORY TO SET UP THE CARB ON YOUR BIKE TO RUN FAIR AT BEST, BUT WHEN THE 40MM CV IS SET UP CORRECTLY FOR EACH BIKE, THE IMPROVEMENT IS HUGE. ON A STOCK BIKE THE PROBLEMS MENTIONED ABOVE WILL BE ELIMINATED, AND THERE WILL BE A VERY NOTICEABLE INCREASE IN THROTTLE RESPONSE AND POWER. IF YOU HAVE A HIGH PERFORMANCE AIR CLEANER AND A GOOD AFTER MARKET EXHAUST SYSTEM, WITH ONE OF MY CARBS YOU WILL GAIN 10 + HORSEPOWER AND DEPENDING ON YOUR PIPES UP TO 10 FOOT LBS. KILLER M/C PRODUCTS PERFORMANCE TUNED 40MM CV CARBS ARE REMANUFACTURED WITH STRICT ATTENTION TO QUALITY, DETAIL, AND PERFORMANCE. EACH CARB IS DISMANTLED PUT THROUGH A STAGE ONE CLEANING PROCESS TO REMOVE ALL THE CARBON, [THIS IS A MUST ON CV CARBS]. THERE ARE SIX TINY PASSAGES IN THE CARB BODY THAT CLOG WITH CARBON AND MUST BE COMPLETLY CLEANED. ALL THE OTHER PARTS ARE THEN CLEANED AND INSPECTED, AND PARTS TO BE REPLACED ARE DISCARDED. EXTENSIVE MODIFICATIONS TO THE CARB BODY, FLOAT BOWL, AND SLIDE ARE THEN PERFORMED. WHICH INCLUDE PROFESSIONALLY POLISHING THE CARB THROAT AND RESHAPING AND POLISHING THE SLIDE AND RECALIBRATING THE SLIDES LIFT PRESSURE. ALL THE THREADED HOLES ARE CHASED AND CLEANED. AFTER POLISHING AND GLASS BEADING IS COMPLETED ALL PARTS GET A FINAL CLEANING AND INSPECTION. THE SET UP DESIGN IS NEXT BASED ON THE CUSTOMERS BIKE. THE CUSTOM TWO BOLT ORINGED MOUNTING FLANGE IS PRESSED ON AND THE CARB IS THEN ASSEMBLED USING THE CORRECT NEEDLE, EMULSION TUBE, AND JETS. NEW STAINLESS STEEL BUTTON HEAD SCREWS AND A KILLER MOTORCYCLE PRODUCTS DIAPHRAGM COVER. THE CUSTOM CHOKE KIT IS INSTALLED WITH YOUR CHOICE OF BILLET CHOKE KNOB DESIGN. BENCH ADJUSTMENTS ARE MADE AND SLIDE OPERATION IS TESTED. 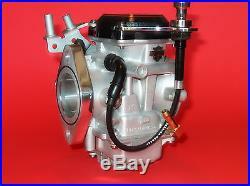 THIS CARB COMES AS PICTURED WITH FLANGE AND COMPLETE CHOKE SET UP INCLUDED. 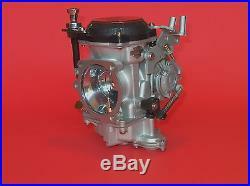 IF YOU WOULD LIKE A CARB FOR SOME OTHER MODEL Check out my other items. THIS IS NESESSARY TO DESIGN THE CORRECT SET UP, [NO ONE SET UP IS CORRECT FOR ALL BIKES]. PROPER INSTALLATION IS THE RESPONSIBILITY OF THE PURCHASER. CHECK LOCAL EPA REGULATIONS FOR YOUR STATE BEFORE PURCHASING. FOR OFF ROAD ONLY WHERE REGULATED. Check out my other items. KILLER MOTORCYCLE PRODUCTS IS IN NO WAY AFFILIATED WITH, SPONSORED, OR AUTHORIZED BY HARLEY DAVIDSON MOTOR COMPANY. ANY REFERENCE RELATED TO "HARLEY DAVIDSON" OR ANY HARLEY DAVIDSON MODELS IS SOLELY FOR IDENTIFICATION PURPOSES AND IS NOT INTENDED TO CREATE ANY CONFUSION OR DECEPTION IN THE MARKETPLACE. 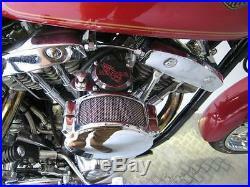 The item "HARLEY DAVIDSON SHOVELHEAD CV40MM PERFORMANCE TUNED" is in sale since Monday, April 13, 2009. This item is in the category "eBay Motors\Parts & Accessories\Motorcycle Parts\Air Intake & Fuel Delivery\Other Intake & Fuel Systems". The seller is "dale1979ta" and is located in Glendora, California. This item can be shipped worldwide.